Catalogue CS Travel In-store Expires today! Add Popular to your favourites! Warehouse Sale up to 90% off! Cathay Cineplexes Singapore screen the latest Hollywood blockbusters as well as hit movies from around the region and artshouse films. There are 7 Cathay Cineplex locations in Singapore. For a luxurious experience, go for the Platinum Movie Suites. Visit the webpage to learn about the latest Cathay Singapore promotions and to book your tickets online. Are you a film buff? For artshouse and indie films, head to Cathay Picturehouse. In Singapore, Cathay Organisation started operating its first cinema when it opened the Cathay Building in 1939. Cathay Cineplexes uses state-of-the-art technology, digital projection and THX certified halls. 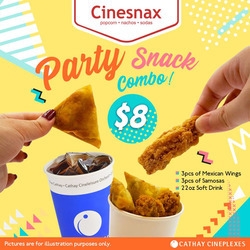 Do you want to receive more offers from Cathay Cineplexes by email?